For regular readers of this blog you’ll know i’ve penned multiple posts on Richmond’s erroneous real estate market. Having grown up in Richmond it’s been eye opening to see how much the city has changed over the past few years, and not for the good. Politicians and Richmond Mayor Malcolm Brodie have completely turned a blind eye to a flood of foreign capital displacing locals which has created a false economy completely dependant on real estate. 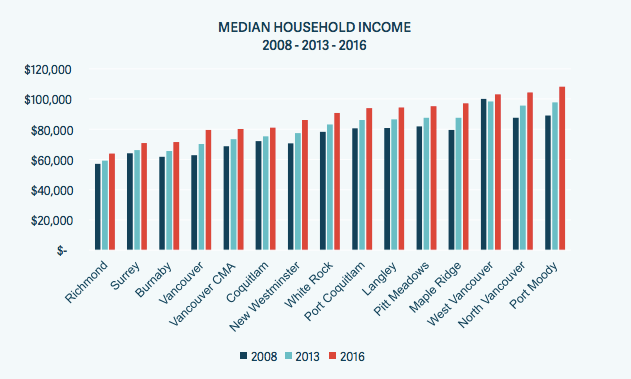 Just last week a report from Site Economics shows taxpayers in Metro Vancouver’s traditionally “upper and middle class” western urban centres, such as Vancouver, Richmond and Burnaby, are reporting unusually low taxable median family incomes, well below the regional average. The city of Richmond had the lowest reported taxable income in Metro Vancouver yet some of the highest house prices. The benchmark price of a detached home in Richmond has surged by nearly 80% over the past three years and now sits at $1,589,000. The housing affordability ratio created by these very low incomes and very high housing prices makes it clear that not all income is being reported for tax purposes. Otherwise, for no apparent reason, Richmond has perhaps the highest income to house price ratio in the world. It is important to note that a ratio of 5 is considered overpriced, Richmond sits at 28 and demographics show Richmond is not dominated by renters or seniors. Instead, Richmond had the highest concentration of foreign buyers, which made up nearly 25% of real estate purchases before the introduction of the BC Government’s foreign buyers tax. And so, local taxpayers are subsidizing public services for foreign nationals who are providing very little economic benefit besides property taxes. Professor of public policy at SFU Josh Gordon summarized it perfectly in a recent report which can be found here. Study Shows 46% of Richmond Condos are Sold Vacant. Richmond aka the Ghost City, is littered with empty condos as offshore investors use them to park speculative money. Richmond has a growing epidemic of Illegal hotels and Guest Houses. Richmond farmland being pillaged for mega mansions.